This organismic analogy for a business enterprise is more apt than ever in today’s challenging and precarious business landscape. In the ecology of Asset Servicing – with global markets still reeling under the after-shocks of the 2008 credit crunch, crisis looming over the Eurozone and now an unprecedented wave of new tax and regulatory ordinances like FATCA, Dodd-Frank, Basel III, and T2S etc. on the horizon – Consistency, Safety and Assurance can no longer be the dominant genetic traits of this organism. Evolutionary transformation would expectedly be fast-tracked due to these impelling stimuli and the resultant genetic mutation will bring hitherto submissive genetic traits of Transformation, Compliance, Agility, Innovation and Competitive Differentiation to the forefront. The onus of this transformation will be on the service providers, obliging them to recondition their business by aligning people, processes and technology to the new regulatory requirements as quickly and efficiently as possible. As the business changes, so must its processes and, consequently, it is imperative to prudently manage and control all aspects of this change. Business Process Management (BPM) provides the necessary framework to design, enact, control and analyze this ever-impending transformation of operational business processes. In the contemporary business landscape, BPM methodologies are deployed to improve the effectiveness of business processes, and/or implement systems that enable automation of process activities, and Business intelligence (BI) tools are focused primarily on providing performance metrics or an aggregate view of business. These two business enablers are inherently decoupled and assumed to address distinct business needs, which in turn reflects a disconnect between the strategic and operational layers of an enterprise. To bridge this gap, a robust link needs to be forged between data (BI) and processes (BPM) by incorporating high-level strategic, as well as drill-down metrics, in each stage of the BPM lifecycle – from process diagnostics, to defining Key Performance Indicators (KPIs), to defining business and workflow routing rules. To start with, information and analytics produced by BI tools can be leveraged to appraise the existing process model and identify areas of improvement. Once the target process model has been implemented, BI can be utilized to provide visibility into the current processes and means to extract key metrics against which the effectiveness of the design can be judged. And eventually, process data from real-time operations can be fed back into the next iteration of process improvement activity to facilitate continuous tuning of processes. Coupling of BI with BPM can also lessen the overhead associated with any manual decision point in the process flow at which human interaction is required. BI-driven alerts can be incorporated into the process flow to place contextual information in the right hands exactly when a decision needs to be taken. The gist of this BPM-BI bridge is pertinently reflected in the age-old management adage – ‘You can’t manage what you don’t measure’. As in any business ecology, in the end it all boils down to the struggle for life (read: Survival of the Fittest) and only those organisms best adapted to changing conditions will be able to survive. 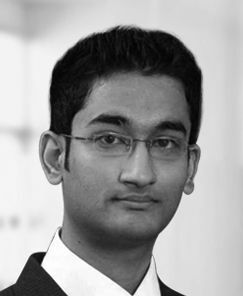 About the Author: Anshul Rajput is a Product Consultant at Information Mosaic. He has extensive experience in the application of engineering processes for Post Trade Automation services and in the implementation and design of Capital Markets solutions for major financial services entities including Asset Managers, Global Custodians and Private Wealth Managers.